Hey everyone! It’s been a few months. I have neglected many things worthy of blog posting, but I will get back to those later, because today I want to be as controversial as possible and talk about having tattoos as a young Christian girl. Long story short, when I was a kid my dad told me about his tattoo (a ghoul on his shoulder) and how much he regrets it now. -He told me that when he got it, he wasn’t really a believer. -side note- he also almost passed out after he got it (which is really funny because my tattoos have not gotten close to making me pass out) But anyway, generally speaking I was raised in a home that did not necessarily approve of tattoos OR piercings for that matter. Now fast forward to high school.. I was friends with people a few years older than me, and some of them had tattoos. After knowing people who had them and who were really nice, I learned that alot of presumptions made about people with tattoos are wrong. This got me also thinking that I kind of liked the idea of having ink on my body- ink that MEANT something. So when I was just 15 years old (maybe 16, its a little blurry), I drew out a sketch of what I wanted tattooed. My very dear friend Michelle Do redrew it because I am a horrible artist, and the countdown began. Everytime tattoos came up in conversation from then on out I would show people what I was going to get. Every one who has known me on a friendship level has known how badly I have wanted this and how long I have waited for it. SO, my 18th birthday comes around and I go see the wonderful Brandon Neu at Sacred Art Tattoo and he revises the drawing again, and tattoos it on my body. 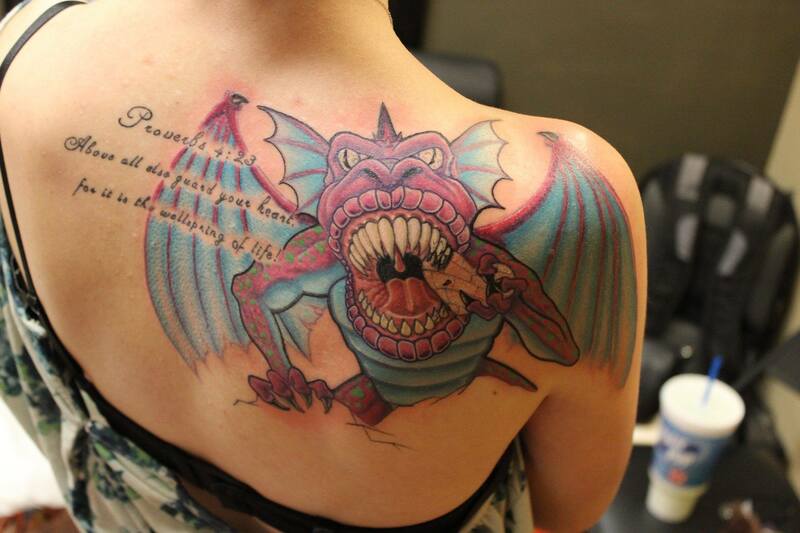 I’ll spare you the details on the healing process… anyone who has a tattoo knows how it goes. Now, to those of you who are the typical clean cut person who hates tattoos, this is horrifying and terrible and I should get it removed, right? Or covered with butterflies. And to those of you who know me, you know that I am not a girly girl therefore I am not destined to be a pansy, and that this is a perfect representation of my taste in art mixed with my love for my God who created me. The monster represents evil, darkness, whatever you see as a threat. The heart in the monster’s hand is made out of bricks, as an ode to Paramore’s “Brick By Boring Brick”, specifically the line that says “Build your heart brick by boring brick, or the wolve’s gonna blow it down.” This heart is colored with white ink because it is a heart made pure by the grace of God my savior. After I get this finished, the monster’s teeth will be cracking as a further representation of building a strong heart (with metaphorical bricks) haha, punny. 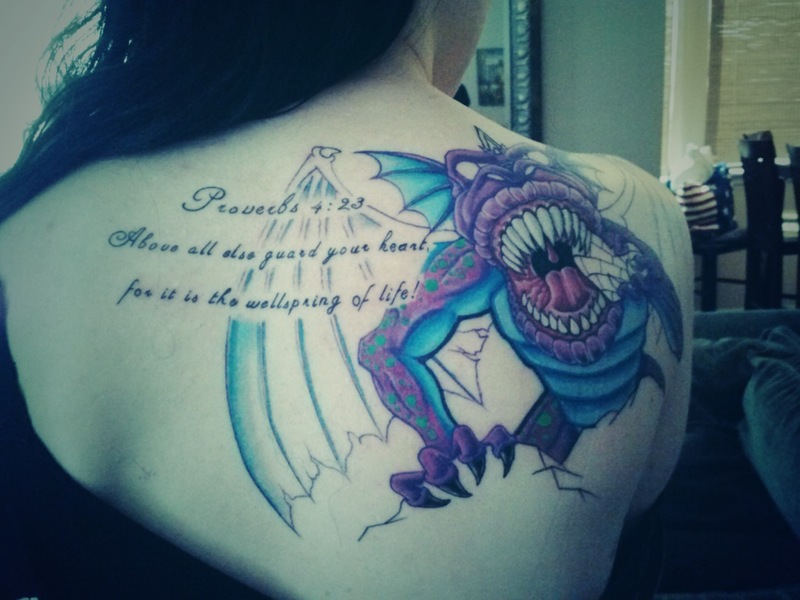 Lastly and most importantly, Proverbs 4:23 is inscribed on my back. It reads: “Above all else, guard your heart, for it is the wellspring of life!” I think that verse sums up the entire concept of the tattoo. So maybe next time you see something crazy like this inked onto a sweet looking little girl like myself, try asking what it means and maybe connect and make a new friend in the process. People with tattoos are not all hoodrats. In fact, its a labor of love in a manner of speaking. The pain is ultimately put up with to share art, and a lot of the time people’s personal stories. In this day and age, body art is a form of expression, not something that should be put down and judged. So to those of you who are Christians, condemning other Christians because of their tattoos will not assure your salvation any more than it will take away theirs. Have some respect, there are many different ways of being brought up and each one of those cultural differences should be tolerated, if not embraced. If you have any questions or comments, please do not be afraid to ask or share! P.S., if you quote Leviticus to me, you’d better be able to tell me who wrote the book, what the previous chapter talks about, and why the verse is relevant in TODAY’s culture. Thanks and have a great Friday the 13th weekend, lovelies!